2016 really was the year of the flood in the U.S.: In total, 19 separate floods swamped the nation last year, the most in one single year since records began in 1980. This is according to an analysis by Munich Re, a global reinsurance firm. 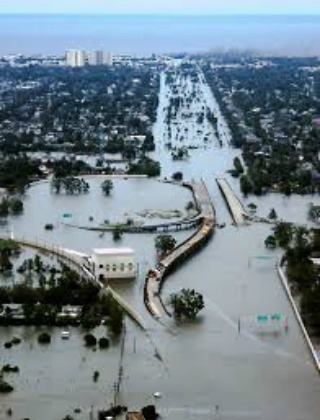 The worst flood was in August in Louisiana. At least 13 people were killed and roughly 60,000 buildings were destroyed. The disaster cost $10 billion, Munich Re reported, which noted it was the worst natural catastrophe in the U.S. since Hurricane Sandy in 2012. “We had a lot of severe flash floods in heavily developed areas,” said meteorologist Mark Bove of Munich Re. Other major flood disasters in 2016 included those in West Virginia in June, Houston in April and Maryland in July. “We did get very unlucky” last year, Bove said. The 19 floods in 2016 were an increase from 2015, when there were 15. We can no longer just shrug off our shoulders and ignore global warming. The quality of our lives will forever be connected to the climate. Severe flooding can result in loss of human lives, deterioration of health, damage to property, loss of livestock, and destruction of crops that is worth millions to billions of dollars just all wiped out. Days of heavy rain have swamped homes and businesses in North Carolina and Tuesday brought more rain into the forecast. The National Weather Service issued a flood warning until 11:30 p.m. for Raleigh, the state capital, and surrounding counties. It warned that many roads are still closed and said the waters will be slow to recede. CNN meteorologist Pedram Javaheri said 5-7 inches have fallen in parts of the state since Monday. Nick Voss said he had about 30 inches of water in his garage on Tuesday morning. His house is elevated to meet flood standards, so his living area is safe and dry. He had also moved his vehicles to higher ground before the flooding. Flooding can be catastrophic especially with sudden and powerful flash floods that happen with such short notice that can destroy homes, structures, bridges and vehicles. Your home is no longer your safe haven as it can not always protect you from the force of these raging waters. Your health is also at higher risk because floods can contaminate bodies of water with chemicals and other toxic substances that are spread by the water’s current. You can easily become homeless as well. The Louisiana flood during the onslaught of Hurricane Katrina in 2005 is the worst experienced in America followed by Hurricane Sandy otherwise known as “Superstorm Sandy” that hit the East Coast in 2012 and the second costliest storm in the history of America. Those two hurricanes brought with it severe flooding that wiped out cities and communities and left thousands of families homeless and completely dependent on federal assistance. All Americans can see the trend quite clearly now. Calamities are getting worse and destruction is costlier than ever. 19 major floods hit the United States in 2016 alone. Will the number go up this year when the Trump government decided to cut back funding on various government agencies he considers not that relevant in rebuilding the greatness of his America? It includes budget cuts on the arts, education and various environment programs established by the Obama administration to help counter the threat of continued global warming and climate change.